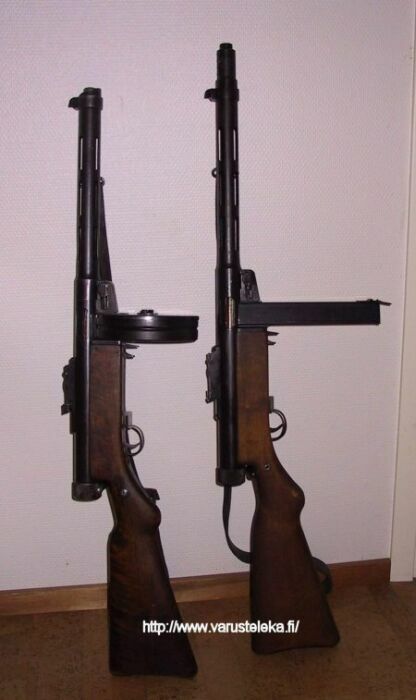 Two most common models of KP M/31 "Suomi", or in English, SMG Model 1931 "Finland". 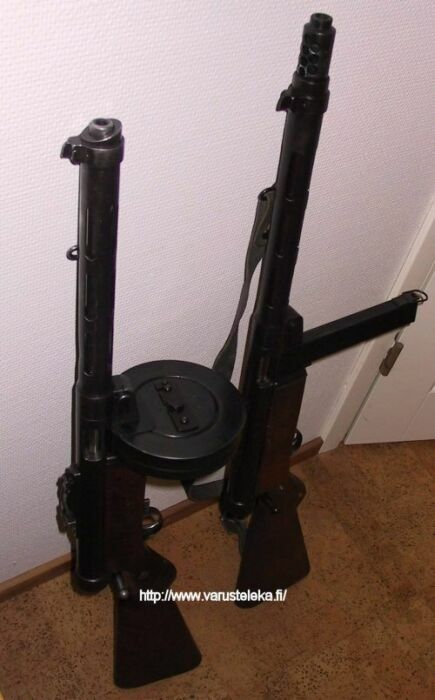 The first is the standard model that fought the Winter War 1939-1941 and the second (on the right) is the KP M/31 SJR which was made during the Continuation War 1941-1944. The SJR is exactly the same with the exception of an added muzzle brake. SJR is "suujarru" for short, which literally stranslates into "muzzle brake". Production of the guns stopped after the second world war. The standard model has the trademark of the gun, a 75 round drum magazine, which inspired the Russians to develope a similar thing to their PPsH. The SJR has the slimmer of the two types of stick magazines. The Suomi-konepistooli, as it was called, is among the most accurate machine pistols of all times, with a maximum effective rance of 300m in ideal conditions. Rate of fire is about 800rpm with standard 9x19mm Parabellum ammunition. Good quality Finnish ammunition can yeld to a rate of 1000rpm. The gun shoots select fire from open bolt with blowback action. The barrel jacket can be removed with a twist from a knob and thus barrel replaced in the matter of seconds, just like in machine guns. Guns were issued with two barrels. Besides that it is very sturdy, literally made to last. The quality of work and extra rigidness were to be the bad sides of the gun too, as it was too slow and costly to manufacture to supply the need of even the small country of Finland. The gun was used by the FDF, Finnish Defence Forces or Puolustusvoimat from 1931 and the actual action of the phasing out has started only during the few recent years, even though the assault rifle has officially replaced machine pistoles from service since the 60's. Troops were trained to use the Suomi still in 1980's. Update: I have received some emails about the 300m range I stated above. I have not personally measured it, but it appears in several written sources. It is to be noted that the Finnish Defence Force used and still uses special SMG-grade 9x19mm ammunition, which is much stronger but has the same dimensions as normal 9x19mm Parabellum catrige. If this ammunition was accidentally loaded into a pistol, it would fire, but also break the pistol. Standard 9mm can be used on the submachinegun too.